UU’s Dino Tharp (pictured) crosses the plate after belting a home run against Miami-Hamilton. 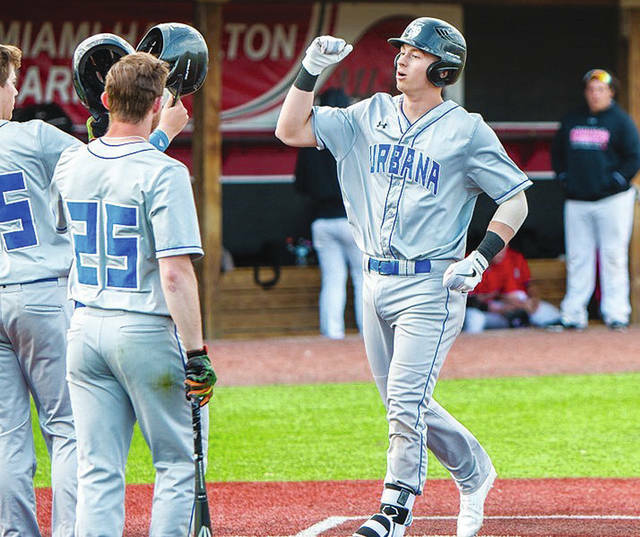 HAMILTON, Ohio – The Urbana University baseball team picked up a non-conference road win, moving past Miami-Hamilton, 13-4, at Foundation Field. UU (3-16) racked up four extra-base hits in a six-run seventh inning to break open a game that was tied 4-4. The outburst at the plate was capped by a two-run home run by freshman third baseman Dino Tharp – his first collegiate hit. Griffin Stevens scored the go-ahead run on a throwing error and then Robbie Guerrero III and Tyler Dellerman roped back-to-back doubles to make it 7-4 Blue Knights. Two batters later Tharp homered to left field. Then, MUH’s sixth error of the game allowed another run to cross to give UU a 10-4 lead. Tharp provided two more runs in the eighth with a single to left field. He broke out with a career-high four RBI while recording four assists and two putouts in his first start. Guerrero also racked up four RBI with a pair of doubles and a sac fly. He has a team-high nine doubles on the year. Brett Bell (3 for 4), Stevens (3 for 6, 2B) and Dellerman (2-5, 2B) also delivered multi-hit outings. Triad graduate Briley Harlan picked up an RBI after getting hit by a pitch with the bases loaded, which brought the final UU run across in the eighth. Also, Chase Carney (1 for 4) reached base five times and scored four runs. UU sophomore Ryan Townsend got his second start on the mound, allowing five hits in four innings of work. He exited the game with UU trailing 3-2, but Guerrero’s RBI double in the fifth created a no-decision for the right-hander. Townsend worked quickly to get through the first two innings, but suffered a bit of turbulence in the third. After a lead-off walk and a hit batter, MUH’s Tyler Thamann made him pay with a three-run homer to left field. Senior Jackson Everman (1-3) took over in the fifth and worked three solid innings of relief to earn his first win of the season. He surrendered one unearned run and one hit while striking out three batters. Relievers Taylor Lane and Guerrero slammed the door in the final two frames. UU outhit Miami-Hamilton (10-16) 13-7 while taking advantage of seven Harrier errors. UU opens a nine-game homestand with Sunday’s doubleheader against Glenville State. Game 1 against the Pioneers will start at 1 p.m.
https://www.urbanacitizen.com/wp-content/uploads/sites/36/2019/03/web1_UUtharp.jpgUU’s Dino Tharp (pictured) crosses the plate after belting a home run against Miami-Hamilton.